Sir Peter Lely, who was born in Germany to Dutch parents, received his early artistic training in Haarlem before moving to England c.1643, where he built up a successful practice working for both Royalists and Parliamentarians. By 1660 he was one of the most celebrated artists in Britain; he was appointed 'Limner and Picture Drawer' to the Charles II that year and granted an annual pension the next. Although Lely painted a number of portraits of the king, it was the Duke of York and his first wife, Anne Hyde, whom he depicted most consistently. They first sat to Lely for a pair of portraits commissioned by Anne's father, the Earl of Clarendon, to commemorate their marriage in 1660 (Scottish National Portrait Gallery). Other important commissions from the duke included a set of portraits of naval flag-officers and from the duchess, the series of paintings of women at court, known as the 'Windsor Beauties'. The Duke of York, the future James II, is shown here wearing robes of state and the Collar and Great George of the Order of the Garter. The portrait was copied many times and became, to some extent, his official likeness. Lely painted the duke on a number of other occasions, including a three-quarter-length portrait in armour (RCIN 403224). 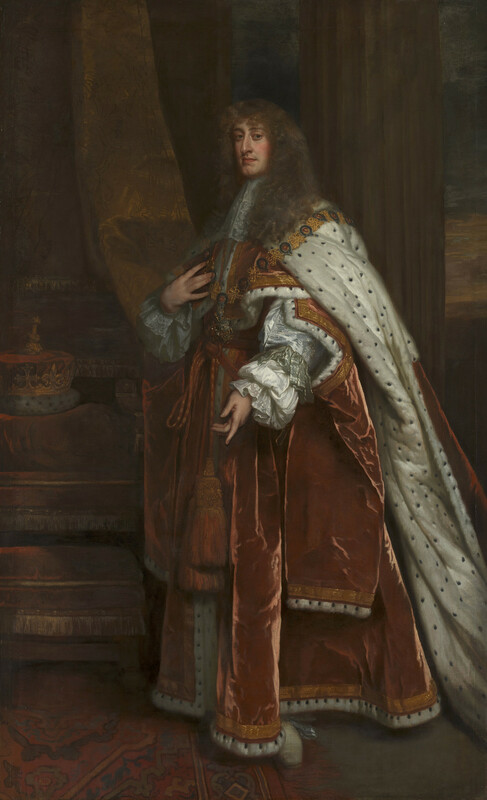 At Lely's death in 1680 there were 16 copies of portraits of the Duke of York, including six full-lengths in his studio, and James II's inventory of 1688 records three unfinished portraits of the then king, all at St James's Palace. The present portrait is first documented at Windsor in Queen Anne's inventory of c.1705–10.